Powder flow is a key metric for the pharmaceutical manufacturing process design. Understanding the impact of powder behavior during pre-formulation will ensure clinically effective products and provide critical process knowledge to design an efficient and reproducible manufacturing procedure. Extremely potent and costly actives incorporated in small volumes pose a particularly challenging concern during formulations and their characteristics must be understood prior to transfer to manufacturing operation. The segregation of powder blends and the interruption of flow when a powder is transferred to a tablet press is a crucial problem in direct compression operations. Dry powder blends must flow uniformly into the tablet dies to obtain consistent weight, hardness and content uniformity. 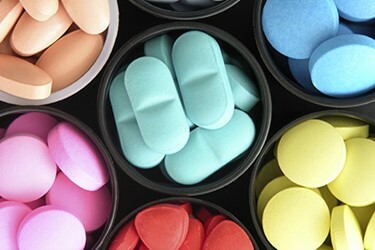 It is therefore very desirable to understand the flow properties of tablet and capsule formulation excipients, active compounds, and formulation blends early in development and establish a reliable early detection of possible variables that can prevent robust manufacturing processes that will deliver in-specification product performance. In powder-handling processes, flow stoppage is a common source of downtime, rework and wasted product. Arches and ratholes are caused by powder strength exceeding the stress caused by the mechanical and geometrical properties of the hopper. These can form due to high wall-friction, and from the tendency for low-angle hoppers to cause “funnel flow”, when product near the walls does not flow until the center material has been removed. With proper knowledge of powder bulk strength and the stresses caused by process equipment parameters, these costly hang ups can be detected in early stages of formulation development, then mitigated or eliminated with the use of excipient materials and appropriate process equipment.